Congratulations to Dr. Keqi Tang, Pacific Northwest National Laboratory Inventor of the Year for FY 2007. The PNNL Inventor of the year award recognizes innovation that has resulted in the creation of intellectual property or the potential to create intellectual property. 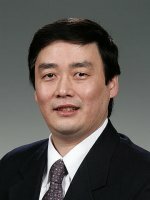 Tang, who joined PNNL in 2000, was chosen for his work in developing novel innovations in the field of mass spectrometry. He currently has 19 currently-pending or issued patents and has been named inventor on 11 patent applications since 2006. Tang is known as a hands-on inventor who diligently ensures that conceptual ideas are implemented in working instruments. He has focused on the design, fabrication and testing of new ion sources, ion optics systems, and gas phase separation methods to improve sensitivity and resolution in mass spectrometry. Tang's intellectual property has garnered 8 licenses with commercial firms. He is not content merely to obtain a patent on an invention, but continues to assist in the further development and demonstration of the patented technology for commercial partners. For example, he has directed several projects to design and fabricate the patented ion funnel technology for use in different commercial mass spectrometer systems, including those sold by Waters Corporation, Thermo-Fisher Scientific and Agilent. Looking to the future, Tang's more recent inventions will be a key element of developing a true high-throughput mass spectrometry instrument platform that is critical to the identification and validation of protein biomarkers.